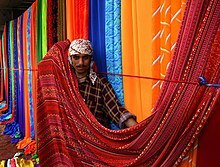 Weaving is a method of textile production in which two distinct sets of yarns or threads are interlaced at right angles to form a fabric or cloth. Other methods are knitting, crocheting, felting, and braiding or plaiting. The longitudinal threads are called the warp and the lateral threads are the weft or filling. 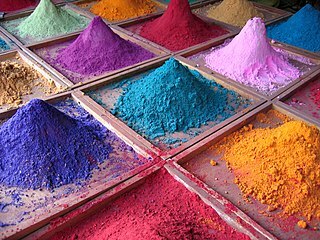 The method in which these threads are inter-woven affects the characteristics of the cloth. Cloth is usually woven on a loom, a device that holds the warp threads in place while filling threads are woven through them. A fabric band which meets this definition of cloth can also be made using other methods, including tablet weaving, back strap loom, or other techniques without looms. Warp and weft are the two basic components used in weaving to turn thread or yarn into fabric. 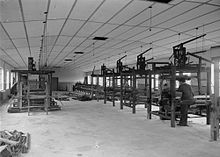 The lengthwise or longitudinal warp yarns are held stationary in tension on a frame or loom while the transverse weft is drawn through and inserted over-and-under the warp. A single thread of the weft crossing the warp is called a pick. Terms vary. Each individual warp thread in a fabric is called a warp end or end. 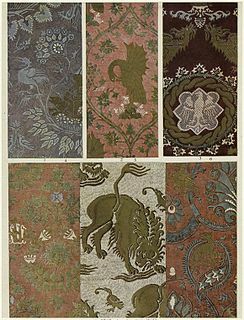 Kasuri (絣) is a Japanese word for fabric that has been woven with fibers dyed specifically to create patterns and images in the fabric. 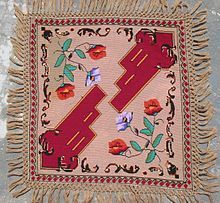 It is an ikat (resist-dyeing) technique. The patterns are characterized by a blurred or brushed appearance. The warp and weft threads are resist-dyed in specific patterns. Prior to dyeing, sections of the warp and weft yarns are tightly wrapped with thread to protect them from the dye. When woven together, the undyed areas interlace to form patterns. Many variations are possible. Kasuri patterns may be applied to the warp or to the weft; or to both the warp and the weft. There are many techniques used to create kasuri. The cloth is classified with different names depending on the method used. A selvage or selvedge is a "self-finished" edge of fabric, keeping it from unraveling and fraying. The term "self-finished" means that the edge does not require additional finishing work, such as hem or bias tape, to prevent fraying. A fiber, a single filament of natural material, such as cotton, linen or wool, or artificial material such as nylon, polyester, metal or mineral fiber, or man-made cellulosic fibre like viscose, Modal, Lyocell or other rayon fiber is measured in terms of linear mass density, the weight of a given length of fiber. Various units are used to refer to the measurement of a fiber, such as: the denier and tex, super S, worsted count, woolen count, linen count, cotton count, Number metric (Nm) and yield. Fabric, cloth typically produced by weaving, knitting or knotting textile fibers, yarns or threads, is measured in units such as the momme, thread count, ends per inch (e.p.i) and picks per inch (p.p.i). A photo blanket is a large, rectangular piece of fabric displaying images, pictures, or designs, often with bound edges, used as a blanket or decorative object. Historically photo blanket were made of thick cloth depicting people, objects, and symbols intended to tell a story or reveal historical events.